Every person is different. And yet we funnel them through the same hiring and onboarding process as if each one was a widget on an assembly line. Understanding the differences in personalities and preferences for both candidates and employees can help organizations to not only select the right people–it can also help to retain them over time. But the question is how? With so much variety, how can we truly understand this diverse group of people? That’s where assessments come in. While 57% of companies are using assessments to select top talent, there is a wide range of usage from companies using these tools for every role to those that don’t use them at all. 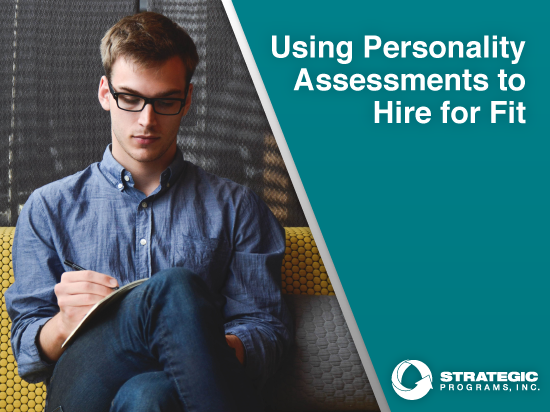 Let’s take a look at what assessments are, how they can help you find the right employees, and how they compare with traditional methods of selection. Let’s imagine that you are planning to hire someone for a job that requires long periods of working alone. How would you be able to ascertain if a candidate is going to be a good fit for that type of role? While you could put them into a room and see how they react, an assessment can help you to quickly and easily determine if that candidate (or the dozens of others that applied for the same job) is going to be able to handle the essential functions of the job. Another increasingly common element is to rate candidates on “fit.” Whether it’s called cultural fit, motivational fit, or something else, the bottom line is that companies want to hire people that don’t have beliefs and attitudes that are contrary to those of the organization’s existing workforce. Again, digging into those elements with a short survey can help to gather a full picture of how well a person would be suited to a particular company or job. “This can be as simple as building a model of what the company is looking for and measuring the specific candidate against it. Or it can be as complex as developing a full interview guide from the model to ensure questions align with the key competencies the company wants to evaluate in the hiring process. There is significant value for our customers in quantifying how far apart people are using this modeling process,” comments Johnson. Below we’ll look at a common, yet powerful set of assessment tools from Professional DynaMetric Programs. Managing– It’s important that a manager understands what environmental factors might motivate and demotivate a new employee. Use this understanding to increase morale and minimize stress, while igniting productivity with tools like ProScan. This tool allows companies to find out what makes a person unique, including uncovering behavioral styles, traits, strengths/competencies and motivators/demotivators, and help determine how the work environment will affect them. Team Building – As collaborative efforts in the workplace become more and more important, management can feel increasing pressure to create high-performance teams. Understand the different people dynamics in your organization to align the best teams and focus on communication, cooperation, and interactions with a tool like TeamScan. This tool can help to ensure that new members of a team will “mesh” with existing staff, or that they will at least be able to identify potential friction points early. Hiring – Matching the right person to the right job is incredibly important for worker satisfaction, which is why analyzing critical job requirements and matching people for the best retention and success is vital. Understanding hiring needs can also help human resources find new ways to attract and hire the best in the field. Tools like JobScan help companies discover what makes your best workers the best, whether it be personality, work habits, or another characteristic. Understanding people is vital for a successful organization. Go outside the box to find out the data that matters most to your organization. For example, one company we work with even uses the PDP output in the onboarding process as a way to help new employees learn more about their own work styles and preferences. In addition, trainers are provided with the reports so the onboarding experience is best suited to meet the specific learning needs of the individual receiving the training. Many companies solely rely on interviews as a way to assess employees. This is not scientific or backed by data, and that reliance can allow for bias in the selection process (conscious or not). That’s where assessments truly shine. The best assessment tools can help companies make decisions that are as much as four times as good at predicting fit as a standard, unstructured interview. On the other hand, some companies use assessments heavily but have not taken the time to focus on how well they match the organization’s hiring process and selection needs. It’s easy to grab an “off the shelf” assessment program; however, for the best results it’s always helpful to work with a partner that understands how assessments are used and how they can be tailored to meet the specific needs of the organization. As with many business areas, those with the most accurate information often make the best decisions. It’s easy to see how leveraging assessments within the selection process is a cost-effective way to make better hiring decisions. All too often companies rush to make a hire only to regret it later. With a defined assessment strategy woven into the hiring process, organizations can hire better candidates faster than the competition.